Adult step-sons: Robert (musician and actor), Richard (retired dentist), and Roger (financial analyst). Grandchildren: More…Nick (20), Bennett (18), Elliott (14), Robbie (12), Sylvia (10). After Tek laid me off in 1994, I spent a year improving the house, mainly by converting the heat from electric baseboard to forced-air gas. I spent many afternoons in the PSU Engineering Library wading through the ASHRAE handbooks for ductwork equations. It worked perfectly and is still in service. In 1996 I attended a job fair and got an offer from Phoenix Technologies, one of the main players in the PC BIOS embedded software market. I've been there ever since. 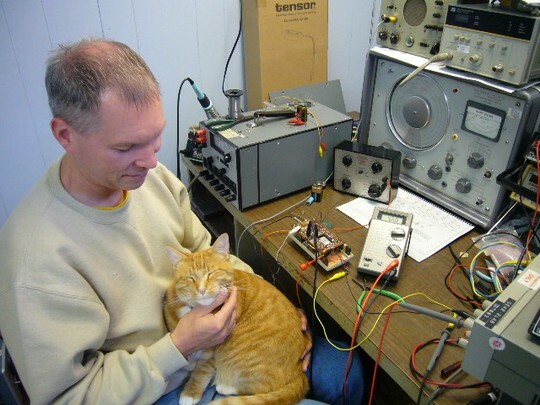 I still read SF, listen to classical music, and repair old radios and test equipment for fun. I'm also still the keeper of the Last Running IBM 1620. In 2006, I remarried (and survived a tumor), and couldn't be happier. My job was sort of given to me. I was still wet behind the ears when I graduated from the University of Portland (BSEE 1980) and had no idea what to do next. A classmate, Mike Ziuchkovski, who already worked at Tek, arranged five interviews for me. I got offers from three and accepted the one for Mike's department, Terminals & Displays Custom Modified Products, working for Chuck Edgar. After several happy years there I moved on to T&D Engineering under Dave Brown, where I helped make the 4205/7/9 terminals. David Wise has a birthday today. David Wise updated his profile. View.